Recently featured in an episode of Travel Channel’s “Bizarre Foods America,” The Fish Market is a Birmingham institution thanks to Chef George Sarris and his international take on fresh seafood. Inspired by traditional Greek dishes, The Fish Market has an extensive menu filled with catch-of-the day selections and homemade sides. A specialty market inside the restaurant also offers one-stop shopping for seafood, homemade sauces, herbs, locally grown produce and more. George Sarris fully embraces the Greek ideal of greeting every stranger as a friend and has gained generations of loyal customers as a result. His restaurant and menu both revolve around giving people great fresh seafood in a friendly atmosphere, so you know the section of the menu marked “George Sarris’ Specials” are truly that. The Athenian grouper plate features freshly caught fish, prepared and swimming in subtle Greek flavor. 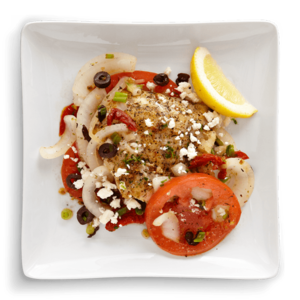 Topped with grilled onions, creamy feta and tomatoes, the full palate of Greece is displayed with the addition of olives and some traditional spices.